Bald eagles, photographed at Jonathan Dickinson State Park, Hobe Sound, Martin County, in January 2019. Bottom taken in Yellowstone National Park. There isn't a more recognizable bird in this part of the planet than the bald eagle, Haliateetus leucocephelus. And believe it or not, there are few places better to see our national symbol than Florida. 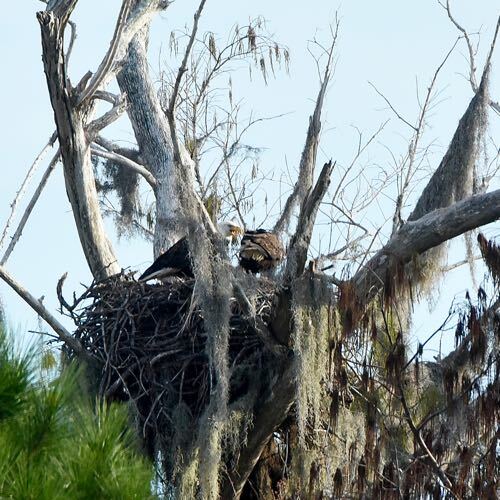 According to the Florida Fish and Wildlife Conservation Commission estimates, there are 1,500 breeding pairs of bald eagles nesting in the Sunshine State. That number includes resident bald eagles, plus migratory visitors such as the pair seen in the top photograph. Census data accumulated by the U.S. Fish and Wildlife Service between 1990 and 2006 showed Florida's eagle population second only to Minnesota among the lower 48 states. Only Wisconsin approached Florida's numbers. By contrast, "Rocky Mountain High" Colorado had 42 pairs, Wyoming 95 and Montana 325. Florida's population more than doubled over that time. The reason for Florida's large eagle population is habitat. 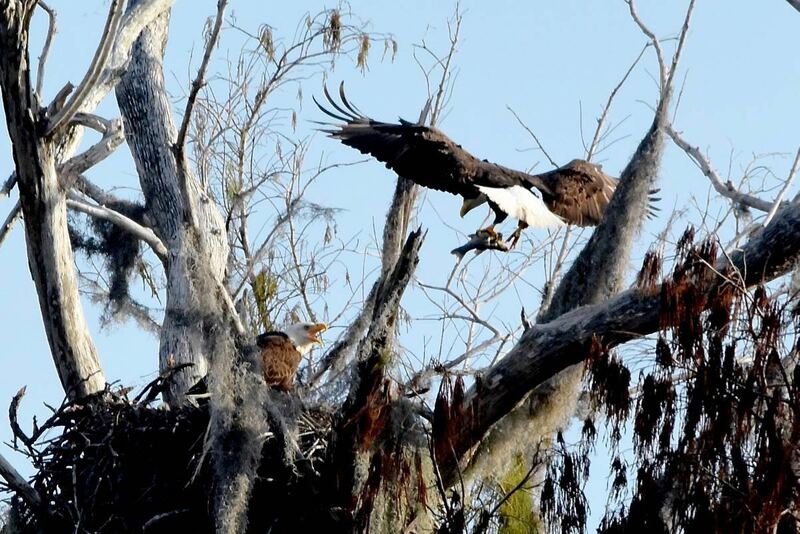 Florida offers plenty of what eagles need: tall trees and open water. The tall trees offer places to perch and build nests, the open water provides fish, one of the staples of the eagle's diet, as shown in the photo above. Also on the eagle's menu: reptiles, amphibians, birds and small mammals. They'll also eat carion. They are known to gorge food and digest it over days; they also can fast for days, even weeks. The story of the bald eagle is one of decimation and recovery. In 1782, when the eagle was designated the national symbol, there were as many as 100,000 nesting pairs of eagles in North America. However many saw eagles as nothing more than avian vermin that preyed on livestock; eagles were hunted nearly to extinction by the 1930s. In 1940, Congress passed the Bald Eagle Protection Act that prohibited their killing. The aftermath of World War II brought a new threat: DDT, a widely used pesticide. DDT residue, however, worked its way into the food chain and eventually contaminated the animals eagles preyed on and ultimately, the eagles themselves. The pesticide inhibited the eagles' ability to absorb calcium, the material eggs are made of. Egg shells from affected eagles were so thin that they'd break during incubation or wouldn't hatch at all. Habitat loss and poisoning from eating waterfowl contiminated with lead shot also contributed to the eagles' decline. By 1963, only 487 nesting pairs remained in the lower 48. Things began to change when the newly formed Environmental Protection Agency banned DDT in 1972. In 1973, Congress passed the Endangered Species Act; the FWS, which administers the act, added the bald eagle to the list of protected species in the lower 48 states in 1978. 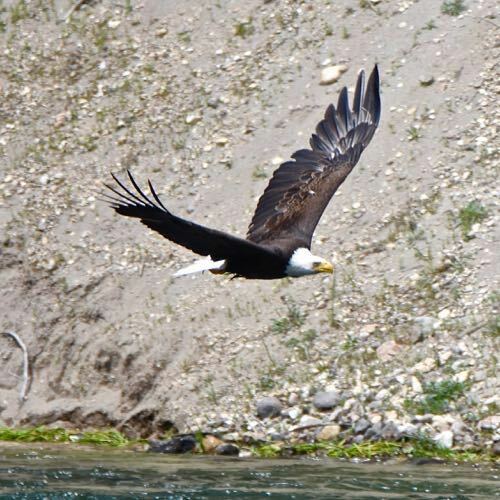 By 2007, there were 9,789 nesting pairs and the FWS removed bald eagles from the Endangered Species List. Today, scientists consider the threat of extinction to be low. 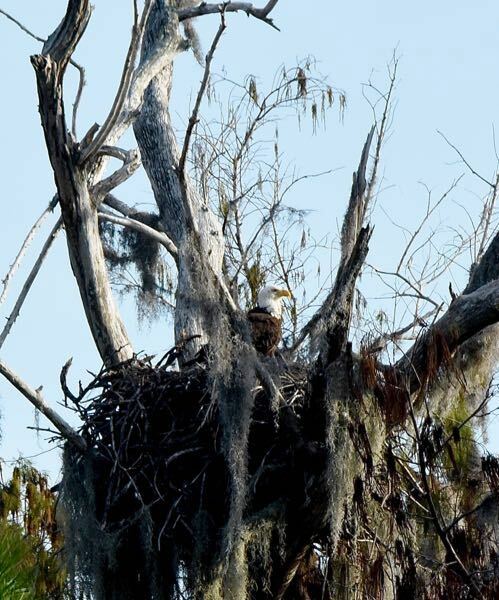 In Florida, bald eagles nest in tall trees, particularly conifers, that afford wide views of the surrounding landscape. They'll select a spot near a lake, a river, a swamp, anywhere they can forage for fish. Besides catching their own, they'll harass other birds, ospreys in particular, into dropping their prey, which they'll scoop up in mid-air. They'll also grab prey right out of their talons. Eagle nests are absolutely huge, five or six feet in diameter and two to four feet tall. Thing is, eagles mate for life, and the same nest may be used year after year by the same couple. And each year, the couple adds more material to what's already there. After a few years, a nest might weigh as much as two tons. Both partners gather material for the nest — sticks mostly, with gaps filled in with grass, moss and other vegetation. Females do most of the assembly, which can take as long as three months to complete. In Florida, nesting season is late fall into mid-spring; up north, spring into summer. Clutches are one to three eggs, which require about five weeks of incubation before hatching. The young, which are fed by both parents, are nest-bound for as long as three months before their first flight. They'll remain with their parents for a month afterwards before striking out on their own. Juvenile eagles are mottled brown and require five years before acquiring the adult's signature white head and tail. A Florida juvenile may migrate as far away as Michigan before returning south. They are long-lived birds, with a lifespan that can reach 30 years or more in the wild. Males and females are identical in plumage, but females are considerably larger than their male counterparts. Females can have a wingspan of eight feet and a body length of three feet. Males have a wingspan of six feet and a body length of more than two feet. Although no longer covered by the Endangered Species Act, bald eagles remain protected by Bald and Golden Eagle Protection Act, the Lacey Act and by the Migratory Bird Treat Act. Florida has protections at the state level. Fun fact: by our usage of the word, bald eagles obviously aren't "bald" at all. However, "bald" derives from a Middle English word that means white patch. The species name, leucocephelus, means white head. Bald eagles are members of Accipitridae, a family hawks and eagles.